Recently I saw some speculation in the forums that Ralf Schumacher lost his speed after his very bad accident in the USGP of 2004. That would not be surprising, given the serious injuries he sustained and the number of other drivers who were not quite the same after big accidents. Olivier Panis was never as quick after breaking his legs in the Canadian GP of 1997 and Johnny Herbert was unable to overcome the weakness in his ankles resulting from an accident in the year before he entered F1. To some extent, physical injury may be the cause of a limitation creeping into a driver's abilities (as it certainly was in Herbert's case), but the realization that one is mortal may also have an effect. Anyone who has been in an auto accident, even if fairly minor, knows the shock and trauma it can cause; it is like a riposte from reality, a reminder that there are no charmed lives in this world. How much more damaging to the psyche must a crash at racing speeds be, with the car disintegrating around the driver, leaving him a helpless passenger? 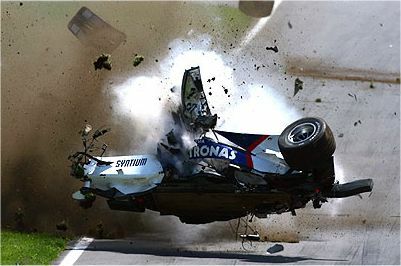 The really amazing thing about motor sport is the speed with which drivers recover from most accidents. I have seen occasions, particularly after multiple pile-ups in the first corner that force a re-start, where drivers can hardly wait for their cars to stop moving before they are throwing off the safety belts, scrambling to get out and run back to the pits for their spare cars. Robert Kubica is reportedly eager to participate in the coming weekend's Indy GP in spite of his horrendous accident in Canada. Drivers rarely talk about this aspect of the sport but, when they do, they generally speak of an ability to shut the possibilities from their minds, a refusal to think of the consequences of a serious shunt. And that is a gift given only to the young. As one gets older, one's own mortality forces its way into the conscious mind and racing becomes more of a balance between the risks and the enjoyment. That is the point at which thoughts of retirement from F1 begin to occur. Having said all that, however, it does seem that some are immune from the process. Fangio did not begin his F1 career until his 39th year and continued until 1958, when he was 47. When we consider that he was regarded as the fastest man of his time, we have to wonder how quick he would have been had he entered GP racing in his twenties. Mario Andretti, too, had a long career, much of it in F1, his last GP being at Monza in 1982 at the age of 42. That he then returned to the even more dangerous sport of Indy car racing until 1994 is a testament to his resistance to the idea of his mortality. Paraphrasing Stirling Moss (the greatest driver to never become world champion) once said that if he knew there was no danger of a wreck, there would be no reason to race. Also, in the recent discussions on the potential speed of F1 cars if all the "slowing" legislation was removed, it was thought the cars could go faster than the humans could drive them. So? Why not let the human capacities govern the potential speeds possible. Why slow the cars? Why not let the drivers be the limits of speed, rather than letting the machines govern speed. Jet pilots handle machines at far greater speeds than possible in F1 cars, and chase enemy jets at the same time. For that matter, pilots of 747 or L1011 jumbo jets land those monsters at speeds greater than F1 cars go, and with hundreds of people on board at that. I say let the design engineers do their work to the limit, and the drivers do their work to their limit. The problem with F1 limits is not just of speed - it's the cornering speed that concerns the FIA. I have seen differing estimates of the g-forces attained by modern F1 cars in a corner but most are over over 5 G. More than that and the drivers would have to consider wearing G-suits and it begins to become very complicated. At high g-forces, the human brain can black out and I'm not sure we want races to be decided by who managed not to black out on the fiercest corner! Sorry. Listen. Do not have an opinion while you listen because frankly, your opinion doesn?t hold much water outside of Your Universe. Just listen. Listen until their brain has been twisted like a dripping towel and what they have to say is all over the floor. I am from Uruguay and , too, and now am writing in English, tell me right I wrote the following sentence: "The latest version of seo booster lite has just been released.Seo software eb ceo includes seo tools in one powerful seo suite." Thanks for the help ;-), Cherlin.